Well, it wasn’t pretty, but the Twins beat the Mariners again, 6-5, at the Dome. 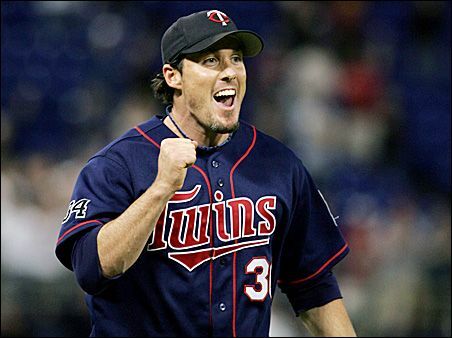 Joe Nathan notched his first save of the season, and his 200th save as a Twin (it’s his 201st career save), putting him within 73 of the mark set by franchise saves leader Rick Aguilera. Starter Kevin Slowey coughed up the lead twice, but the offense came through and scored six runs on eight hits off of former Twin Carlos Silva. Justin Morneau ended his hitless streak right away in the first inning, launching a two-run homer into the upper decks in right field. The Twins have stopped measuring home runs at the Dome this year, but it’s probably safe to say that it traveled a good 425 ft. He also successfully stretched a single into an RBI double that tied the game after Kevin Slowey was roughed up in the fourth (Jason Kubel would later drive him in on a double and retake the lead). Denard Span also had a pretty good night, adding his own two-run blast in the third and drawing a walk. Joe Crede still doesn’t look very comfortable at the plate, going 0-for-4 with three strikeouts. It’s still early in the season, but I am a little concerned about his offensive struggles since he had such an awful spring. Unfortunately, starter Kevin Slowey got hit pretty hard. He gave up five runs on nine hits in five innings, including a couple of two-run home runs to Russell Branyan and Jose Lopez. Slowey didn’t walk any batters and did record five strikeouts, but he was having some trouble locating his pitches. Most of the damage came in two big innings, the two-run blast he surrendered in the second and a three-run fourth (one of those runs scored on an uncharacteristicly wild pitch). After giving up the second home run to Lopez, Slowey settled down and retired the next seven Mariners and eventually got the win. More importantly, though, the bullpen was given the slimmest of leads and, for once, didn’t blow it. Craig Breslow was a bit wild at first, and gave up a leadoff single, but he recovered and retired the next three batters he faced (and struck out Griffey, who he had walked in his brief appearance on Monday night). 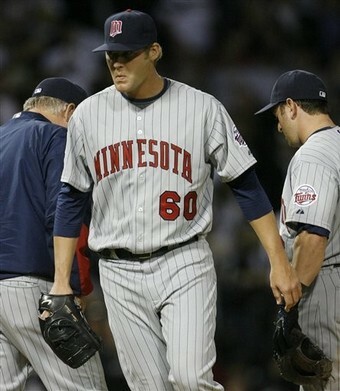 Jesse Crain was an effective bridge to Joe Nathan, retiring all but one batter he faced (he did walk Russell Branyan). His curve/slurve whatever you want to call it looked really filthy, and the hitters who saw it seemed to agree (lots of shaking heads and looks of absolute disbelief). Apparently Joe Mauer’s rehab is progressing well, though he has yet to start running (on land, he has been running in a pool as part of his rehab). Even though he claims he’s only weeks away from returning to the lineup, I wouldn’t expect to see him back until May. It’s going to take him awhile to get back into game shape, though he’s been catching bullpen sessions and hitting off a tee. Meanwhile, Scott Baker might return to the rotation by next week. He is supposed to make a rehab start for the Ft. Myers Miracle on Friday, and how soon he rejoins the team depends on the results. Apparently he hasn’t been experiencing any stiffness in his throwing shoulder, which is obviously very good news. I’m not thrilled about having R.A. Dickey in the rotation for more than a couple of starts. Oh, and Mike Redmond will apparently be the starting catcher today. Hopefully he’ll make it through the entire game without aggravating his groin injury or injuring something else. First it was Joe Mauer and his aching back. Then Brian Buscher had a health scare. 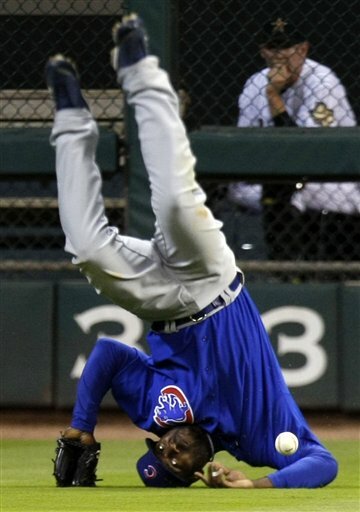 Delmon Young, Joe Crede, and Michael Cuddyer have all been struck with various hand injuries. Justin Morneau is battling stiffness in his back. And if all of that weren’t enough, now starter Scott Baker is going to start the season on the DL with stiffness in his right shoulder. It isn’t clear at this point how long he will be out, and he will be re-evaluated on Saturday, but things certainly aren’t getting off to a very good start for the Twinkies. Baker doesn’t think the stiffness is anything serious and would have preferred to pitch anyway, but the Twins have decided not to take any risks with their $15.25 million-dollar arm. In the meantime, Francisco Liriano has now been given the Opening Night nod opposite Seattle’s Felix Hernandez, and R. A. Dickey will take Baker’s spot in the rotation. With Baker going down, there is now an extra spot in the bullpen, so it looks like both Philip Humber and Brian Duensing will be coming north with the team. The only real position battle left now for the Twins is the final bench spot. Brendan Harris, Matt Tolbert, and Brian Buscher have all been competing for the utility role, with Harris having somewhat of an edge because he’s out of options. The Tenth Inning Stretch has raised the intriguing possibility of Buscher being traded to the Cardinals, as Troy Glaus’ recovery from shoulder surgery isn’t going as well as expected. While I would be sad to see Buscher go, he isn’t the greatest defensive infielder and he isn’t the most versatile, either. Still, I would be kind of surprised if the Twins did move him. Joe Crede is hardly a sure thing at third, and the organization might be more apt to keep Buscher around simply to provide more depth. Speaking of Liriano, he was effective in his brief start against the Red Sox. He was only allowed to pitch three innings, as he will be starting right away on Monday, and gave up two hits and a run while walking one and striking out three. He wasn’t struggling with his command like he was in his previous appearances, which is very good news. Well, it’s good news for the Twins and bad news for opposing hitters. Unfortunately, Brian Duensing wasn’t as effective in relief, giving up a two-run homer to Jason Bay. Luckily the offense was able to bail him out to the tune of seven runs on twelve hits, with Michael Cuddyer doing most of the heavy lifting. By the way, The Answer Man has an interesting interview with Joe Nathan. Wait, Sidney Ponson has a job? Remember all those nice things I said about the Royals? Yeah, never mind. They’ve decided that Sidney Ponson and Horacio Ramirez are going to be the fourth and fifth starters this season. Apparently Dayton Moore was so impressed with Ponson’s performance in the WBC that he thought the pudgy righty could be an effective major league starter, despite all of the evidence to the contrary. Horacio Ramirez is remembered very fondly on the South Side for being the worst reliever in Sox history. What either one of these two is doing in the starting rotation for a major league ballclub is beyond me, especially over the likes of Brian Bannister and Luke Hochevar. Perhaps it’s all part of of some elaborate, Major League-esque scheme to build the worst team in baseball and get out of their lease at Kauffman stadium.